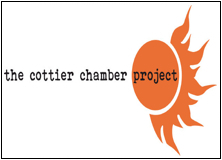 The Cottier Chamber Project began in 2011, following a successful pilot series in 2010 by host ensemble Daniel’s Beard. Running alongside Glasgow’s West End Festival, the Project’s programme is made up of Scottish ensembles and artists, with a diverse range of repertoire covered over a programme that has grown to include 50 events (including a new thread of dance performances) over 3 weeks. Ensembles that have performed include well established names as well as prize-winning emerging artists, and repertoire from renaissance vocal works through to improvised-on-the-spot musicals have been programmed.